Learn how to perform colostomy irrigation. The purpose of colostomy irrigation is to remove stool by instilling an enema through the stoma which stimulates the colon to empty it contents. The physician may order irrigation if the stoma is not putting out enough stool “constipation” or the patient wants to train the colon with irrigation. Colostomy irrigation for bowel training is best for patients with descending and sigmoid colostomy because they still have most of the colon enact, and the stool tends to be more formed rather than liquid. Hence, they will have the most success with bowel irrigation training. It can take up to 2 months for the colon to become “trained” (“Colostomy Irrigation”, 2016). After about 2 months, the patient will be free from wearing a pouching system and will not have bowel movements between irrigations. Instead, they will be able to wear a stoma cap throughout the day, which is a very small closed pouch. Patients with an ileostomy are not candidates for routine irrigations due to the risk of electrolytes and water imbalances and because the stool is never formed like the stool with colostomies (it is always liquid). When training the colon, it is best to perform irrigations at the same time every day (one hour after a meal when the colon is the fullest). The goal is to “train” the colon to empty at the same time everyday. As the nurse, you can perform this in the bathroom with patient on the commode or in the bed with a bedpan or bedside commode. Rest of the time is spent waiting for the bowel to release its contents which will happen in episodes. Attach irrigation sleeve according to the patient’s set-up (one or two-piece). If you are not letting the GI content flow directly into the commode or bedpan CLIP the bottom of the bag with the irrigation clip. Gently insert the cone into the stoma (again it may tense up…be gentle). You want the cone inserted in enough where the water from the enema doesn’t leak out). Use the regulator to allow the fluid to slowly go into the stoma (it will take about 5-10 minutes). Slow down the infusion or stop it, if patient becomes nauseous or experiences cramping…have the patient take a breath and then restart when it subsides). When irrigation bag is empty, remove the cone and make sure the bag is sealed or able to drain into the toilet, bedpan or it is clipped shut. When content is done expelling, dispose of sleeve and clean the area (may change flange…and replace with a stoma cap which is a very small pouch or new bag). 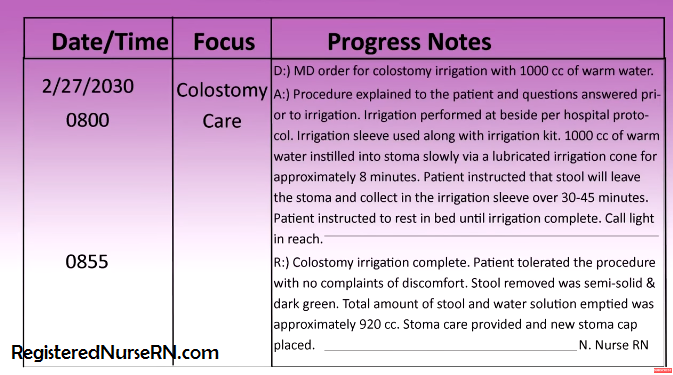 Document per facility instructions: what you performed (actions taken), patient response (stool color and amount, and how the patient tolerated the irrigation), and any education you provided.